Luang Prabang is the historical royal capital of Laos, the Land of a Million Elephants. In literal translation “Royal Buddha Image”, the city was named after the 83 cm-high Buddha statue they elevated to the cult proportions. This palladium is now housed in the Royal Palace Museum. It represents just one example of how political and religious powers intertwined in seven centuries of Luang Prabang history. 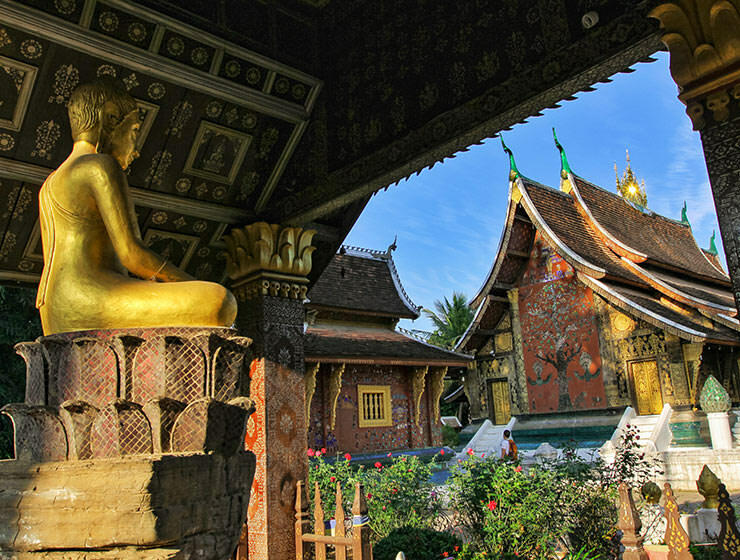 Since 1995, this spiritual center of Laos is protected as one of UNESCO World Heritage Sites. The particular mixture of natural and cultural wonders made Luang Prabang attractions irresistible to international tourists. Well, at least when Laos allowed their arrival in 1989. Many of these tourists are coming from one country in particular. Surrounded by the specific French Indochina architecture, the scents and flavors of la cuisine and omnipresent baguettes, the tourist hordes that just flew in from Paris and even Italian restaurant staff speaking en français, I felt that colonization was happening again. While the heritage that French left undoubtedly contributed to what this town represents today, my list of Luang Prabang sites and points of interest tries to focus on the most authentic Laos experiences. I hope these Luang Prabang travel tips will help you make choices on what to visit in Luang Prabang and create the itinerary that will fit your needs. Do let me know about your own best things to do in Luang Prabang in the comments! 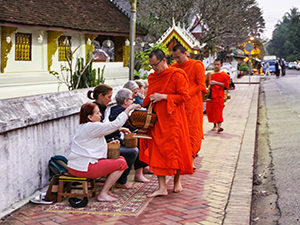 The almsgiving in Luang Prabang is an early morning religious ritual in which locals offer food to Buddhist monks. Just before sunrise, between 05:30 and 06:00 am, hundreds of monks walk through the streets of Luang Prabang old town. In the ceremony known as tak bat, the silent monks of Luang Prabang collect the gifts of food, usually Laos’ favorite sticky rice, in a bowl strapped around their shoulder. Tak bat ritual has sadly become a major tourist attraction. This brought a whole set of problems, especially in these Instagram-obsessed times. Monks and locals became the targets of hundreds of paparazzi amateurs. This image hunters often show a complete lack of respect for the ceremony that should be about respect only. Flash photography, inappropriate clothing, touching the monks… The list of possible sins goes on and on. And on. Even if your best bet would be to station yourself in front of some of the temples on Sisavangvong Road, you could opt for detouring to some of the side streets or even neighborhoods. Ask your hotel about the possibilities! Almsgiving ritual away from the cameras and lined-up tourist herds is a much more authentic experience. After witnessing the monks’ walking meditation during the almsgiving, it’s time to dedicate the next part of the morning to your well-being! 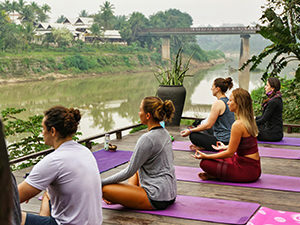 Yoga classes on the open-air deck of the riverside bar Utopia have gained almost cult status in Luang Prabang. Every morning at 07:30, dozens of amateurs and visiting pros show up for their daily dose of yoga. The deck overlooking the Nam Khan River already had to be enlarged, as the interest is humongous. Consider arriving early, unlike me, as at 07:30 not even a needle can fit between the yoga mats! Or… The better solution might be to visit Sena Studio. It is a newer yoga space above the Sena Restaurant on the main street! Julie, the creative brain behind Luang Prabang Yoga, is the person organizing these sessions too! Sena has afternoon classes which start at 05:30 pm and their advantage is that no bad weather can cancel them! Typically, an hour session costs 40.000 Kip (4 Euros), and there are discounts for regulars. If you fall in love with drop-in sessions, you may even consider joining yoga retreats they organize once a month! Rodents – Laos’ best-kept gastro secret! I’m not the most familiar with rodents anatomy, and a woman selling them is not the most familiar with English. 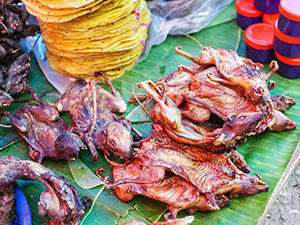 So I can only assume that the most extreme offer of edibles on Luang Prabang’s Morning food market is – rats. Piled on a banana leaf (like most of Cambodian best treats), just next to a tower of tortillas and a sea of fish, their crumpled legs, long incisor teeth, and lifeless eyes lure passers-by for a meal deal of the day. Luang Prabang morning market is a lively event, worth visiting even if you don’t plan on buying anything. From grilled pork’s intestines and cooked silkworms to more bearable myriad of vegetables and live poultry, this place bursts with colors, sounds, and smells. The meat is often chopped live in front of you. Some you can quickly identify. Some are a mysterious puzzle of shape, size, and even hair! 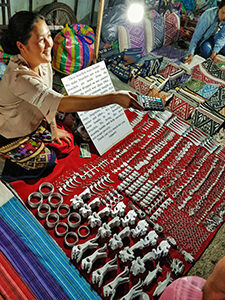 Play a game of guessing, and the food market experience will be one of your most entertaining Luang Prabang activities! The market is open every day, from 8 am until 4 pm. Try getting there early, when the mood is in full swing! Often mentioned as Laos’ prettiest tourist attraction, Kuang Si Falls are Luang Prabang’s must-visit site! Tad Kuang Si is considered to be a group of the most beautiful Laos waterfalls! 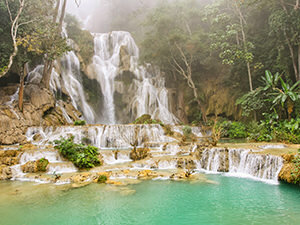 Set in the jungle, some 29 kilometers southwest of Luang Prabang, Kua­ng Si Falls (sometimes spelled Kuang Xi) provide three tiers of tropical paradise setting. In the December-May period, minerals from the limestone rocks give water a milky turquoise blue color. In the rainy season, there might be much more water, but it will also be – brown! While the main fall has a 50-meter drop, the smaller falls create ideal swimming holes. As long as you are not sensitive to the lower temperature of the water, you will enjoy dipping in these natural pools on a warm day! 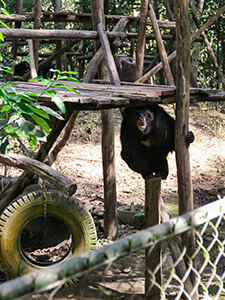 Otherwise, you can just enjoy the view of the cascades from the wooden footbridges, conquer hiking trails, or visit the Bear Rescue Center, Luang Prabang sanctuary for several dozen moon bears rescued from the bear bile farms. To avoid the crowds at the waterfalls, try to get there early, and on a weekday. The waterfall area opens at 8 am and closes at 5 pm. The ticket for Kuang Si Falls costs 20.000 Kip (2 Euros). While most people arrive in songtaews (50.000 Kip or 5 Euros per person) or some organized tour, if you are an independent traveler, you can consider renting a motorbike. I paid mine 110.000 Kip or 11 Euros for the day, plus full gas tank 28.000 Kip or 3 Euros, and 2.000 Kip or 20 cents for the parking. If you do rent a motorbike, make sure to wear a helmet! Beware of the potholes and bumps in the road: there are daily accidents on the route! If you want to do more trekking in Luang Prabang area, consider visiting Pak Ou Caves! Another option is hopping on a waterfall hunting adventure at Tad Sae. Learn to carve wood sculptures from a pro! Wood carving is one of the oldest and greatest Laos skills. It dates back to the pre-Angkorian era! While the craft has been spread in the area together with Angkor temples and Buddhist wats, today the trade is dying off. 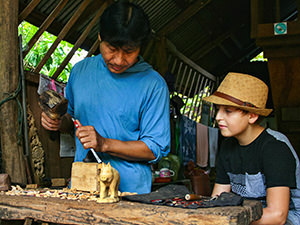 Thanks to the Backstreet Academy, the platform that provides unique and meaningful travel activities that create social impact, you can now have an exclusive experience of wood carving. Mr. Lon used to carve the pieces at the palace for the royal family, and now he can teach you the secrets of his trade. You will be able to make your own carving creation and bring home a unique souvenir! Participation in the wood carving experience costs 24 US dollars (21 Euro). If you are interested in extending your manual talents, in Backstreet academy, you can also learn to craft a crossbow, make a knife or produce Lao Hai, the sticky rice wine, the happiest drink in Laos! Surprisingly for the size of the town, the restaurant scene in Luang Prabang is very developed! 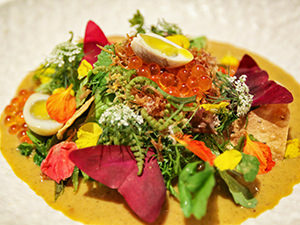 It actually brings excellent gastronomical experiences to foodie travelers! Southeast Asian flavors combined with influences that arrived during the French colonization, have put Luang Prabang food under the well-deserved spotlight. The Paste is one of the best restaurants in Luang Prabang. 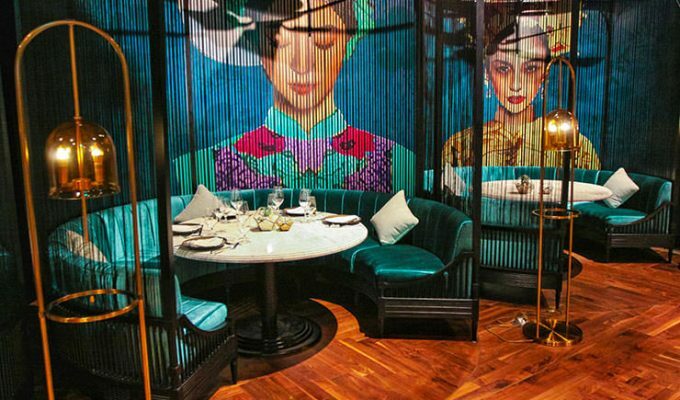 The joint venture of The Apsara hotel and Michelin-starred Paste Restaurant in Bangkok, this new establishment raised the bar for all Luang Prabang restaurants! Led by the chef Bee Satongun, crowned as the best female chef in Asia in 2018, The Paste defends the proportions of 80 % tradition – 20 % innovation. Luang Prabang menu is based on the historical research of recipes of the polymath Phia Sing, the royal chef of Lao kings. My own royal dinner started with double entrée that included coconut cream wafers topped with traditional spiced king prawn relish, and crispy rice cakes with quail. Luang Prabang salad with Asian watercress, salted quails egg, cured fish eggs, and crispy sea kelp was my favorite dish of the evening. I also had to try Paste Bangkok’s signature curry of blue swimmer crab, hummingbird flowers and turmeric, and it didn’t disappoint either! Red Ruby Dessert was a gentle cake combining the flavors of banana, coconut, and jackfruit, topped with a gold leaf crown. Other top restaurants in Luang Prabang that I can recommend are Tamarind (see “the best things to do in Luang Prabang” no. 10), Dyen Sabai Restaurant (it has a beautiful riverside setting), Bouang Asian Eatery (I loved their special cinnamon pork stew, Parmentier style, accompanied by refreshing Beer Lao), and @phonheuang café (a simple and very cheap little place with traditional food). It’s worth knowing that Paste is a part of The Apsara hotel. If you want to be able to lay down just after your meal, think about staying in this former rice warehouse, transformed into one of the best hotels in Luang Prabang. Check The Apsara hotel best prices on this booking link. In a tropical climate, the swimming pool is always a good idea! But The Apsara has its younger sister just across the Nam Khan River, and it’s called (obviously) The Apsara Rive Droite (The Apsara Right Bank). Two sides are connected with a complimentary boat ride – the Apsarian Queen operates on guests’ demand. If you prefer going to Luang Prabang city center independently, there are bicycles you can borrow for free! The best advantage of The Apsara Rive Droite is that this boutique hotel comes with an outdoor swimming pool in a peaceful setting. The spacious rooms have nice balconies and include daybeds. So after your whole-day Luang Prabang travel explorations, there is plenty of options to chill out at this accommodation. 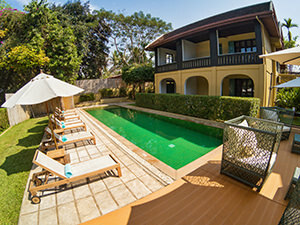 If you want to stay in The Apsara Rive Droite, find their best prices here. Check this Youtube video of The Apsara Rive Droite! If Luang Prabang’s 5-star hotels and luxury resorts are out of your financial reach, you can still find an affordable but comfortable answer to the question “where to stay in Luang Prabang”. Smile Luang Prabang Hostel is less than a 10-minute walk away from the Royal Palace. Its dormitories come with four to ten solid bunk beds separated with curtains for privacy and equipped with individual lamps. The prices here start at 6 Euros per night. Smile Hostel is not just a place to kill an eye during the night. One can relax on the sun loungers in the garden, or socialize with other backpackers in the bar area. Who knows, maybe you’ll get to plan adventures together, which will additionally cut your costs. With a decent amount of comfort, simple breakfast served with a smile, and helpful receptionist that will give you all needed information (or bandages in case you do get to fall from that motorbike), Smile Luang Prabang Hostel has a well-chosen name and belongs among the best hostels in Luang Prabang. For the best prices, make your Smile Luang Prabang Hostel booking through this link. You might not radiate with confidence before the Bamboo Bridge, but give it a try! 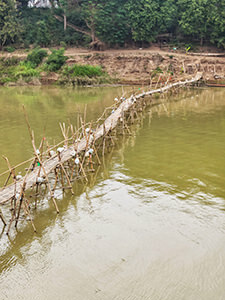 Temporary bamboo bridges connect the two sides of Nam Khan River and operate only in the dry season (November-April). With the rains, water gets high and washes the bridges away. At the next dry season, the bridges will replace boats again. There are two such bridges in Luang Prabang. 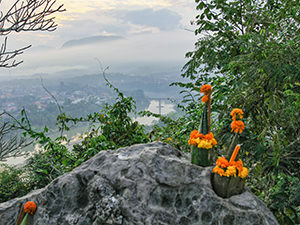 One is connecting the northeastern bottom of Phou Si hill (Wat Siphoutthabath) to the location of Dyen Sabai Restaurant. You can easily combine this crossing with one lunch or dinner! 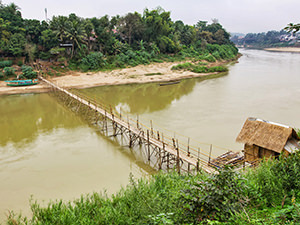 The other bridge is at the meeting point of Nam Khan and Mekong River. Besides their obvious functionality, bridges are an excellent photo opportunity. The local families behind this continuous construction projects charge 5-6.000 Kip (50-60 cents) per crossing. After 6 pm, crossing the bridges is free. Get muddy to get food! Living Land Lao is a community enterprise. This social collective was founded in 2005 with the idea of sharing the land and working on it together. Today, this organic farm is offering travelers an opportunity to engage in the real traditional farming experience! This could include plowing the land with a buffalo, sowing seeds, harvesting rice or cooking it! The experience includes the hearty organic meal (sticky rice, of course! ), the farmer’s hat and tuk-tuk transfer from and to your hotel or guesthouse in Luang Prabang. You can join the morning or the afternoon session in this idyllic countryside. Your hands-on zen experience at Laos village will cost you 43 USD (38 Euros), and you can book it through the Backstreet Academy. Now, this is the experience I didn’t have the time to try, but after eating at Tamarind Restaurant, I would have loved to learn how they make their delicious local specialties! 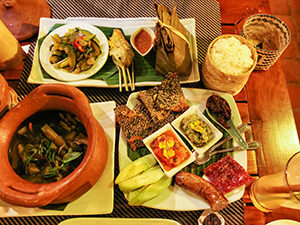 Eat this, and you will fill yourself not only with food but with knowledge of Lao cuisine too! Honestly, their set dinner labeled “An introduction to Lao cuisine” is something you need to try before visiting any other restaurant! This selection of highlights from Tamarind’s a la carte menu, will teach you some basics like how to eat sticky rice with your hands, but also open you up to a myriad of flavors that make Laos cuisine so unique. This menu costs only 240.000 Kip (24 Euros) and serves two persons. It consists of the infused Lao Lao shooter, bamboo and vegetable soup, a platter of Lao specialties (including the famous Luang Prabang sausage, river weed, dips, jeow, sticky rice…), herbed fish steamed in banana leaf, lemongrass stuffed with chicken, stir-fried young pumpkin with kaffir lime and ginger, traditional Laos desserts accompanied by coffee or tea. While the restaurant staff is accommodating in explaining the way to eat the food, I’m sure that cooking it by yourself would be an even more fantastic experience. The cooking class is set at Tamarind’s lakeside pavilions. It includes the pick-up and drop-off, the visit to the food market, and six-hour class. This version costs 285.000 Kip (29 Euros) per person. And you get to eat all that you cooked! Luang Prabang is indeed the temple town! There are 34 Buddhist wats in Luang Prabang center. If you are a temple fanatic, you could spend days exploring them! The entrance to most of them is free! 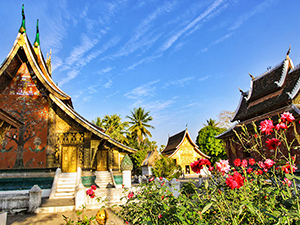 However, if you have time only for one, pay a visit to Wat Xieng Thong! Located between Khem Khong Road and Sakkaline Road, close to the tip of Luang Prabang peninsula, it is one of the most richly decorated temples in Laos! King Setthathirath built this royal temple in 1559 and, unlike most of the other temples, this one was not destroyed and looted during the 1887 Black Flag Army invasion. This is an excellent story for us because now we can witness some impressive temple architecture. The sim, temple’s congregation hall, has been decorated with very detailed golden stencils on black lacquer. Notice the beautiful colorful back wall picturing a mosaic of the tree of life! The chapels, the chariot hall and other structures are also worth exploring. If you decide just to sit on one of the benches and observe the playful temple dogs or monk novices doing their daily chores in a relaxing garden setting, you’ll get a glimpse of what temple life is! The entrance fee for Wat Xieng Thong is 20.000 Kip or 2 Euros! King Sisavang built the Royal Palace in 1904, during the French colonial era. After his death, Sisavang Vatthana ruled from here, as the last king of the Kingdom of Laos. The government took the place over after the communist revolution and opened the National Museum at the premises in 1995. If you are interested in what kind of beds the royal family slept in or in what kind of cars they drove them around, this is the place to explore! Even if the Palace is heavily marked with “no photo” signs, you will see most of the Luang Prabang tourists snapping pictures here with no problem. Bear in mind that only outdoor photography is tolerated so before you plan to enter the main exhibition space, deposit your camera in the locker. Typical working hours of the most significant Luang Prabang museum, are from 8 am till 4 pm. But beware: they start closing some areas at 3 pm already! Also, know that they have a lunch break between 11:30 and 01:30. The entrance fee is 30.000 Kip (3 Euros). 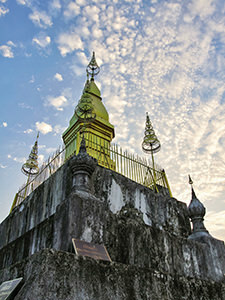 Phou Si is a 100-meter high hill in the heart of Luang Prabang. It is the town’s favorite spot for watching sunrise or sunset. Besides providing a Luang Prabang view from above, this mini-mountain is home to several Buddhist temples. I climbed Phou Si in the morning, but one has to be aware that in the burning season, there is no breathtaking sunrise in Southeast Asia. Sure, on the top you can visit a temple and see Luang Prabang from above. However, the location’s potential ends at being a mini hiking trip! Most of Luang Prabang visitors will climb Phou Si for sunset. But the top of the hill is quite a small place, so I can imagine the disappointment when the crowds start claiming their space, elbowing for the best spot. They will have to pay 20.000 Kip (2 Euros) for that privilege! Don’t take things so seriously! Climb Phou Si because it is a hiking opportunity, and can bring you to some smaller temples and even a cave shrine. For the real Luang Prabang sunset, better go to the banks of Mekong. Sunset hunting is a great excuse to cross the river by boat, and explore the temples on the other side. Phou Si is much more beautiful when you watch it from some other place than from its own top. All this walking up and down will undoubtedly make you thirsty. And keeping hydrated in the tropical climate is essential! The good news is that you do not need to buy a new water bottle every time you need a sip! Luang Prabang is dotted with public refill stations, where you can get your bottle refilled, for free! Download this handy Luang Prabang map of water refill stations, so you can find the closest one when the thirst arrives! Keep hydrated while taking care of the environment too! Every year, travelers in Laos consume 100 million disposable water bottles! Luang Prabang doesn’t need another plastic container you will use once and dump it! Also, know that using plastic bottles means burning more waste. This is not just an enemy of your health, but also an enemy of that Phou Si sunrise you want to photograph so much! Learn more about Jaya House RiverPark, the Cambodian hotel that initiated the project “Refill, Not Landfill”! Getting a body treatment in Luang Prabang is very easy. The traditional Lao massage is done in loose clothes and involves applying pressure that could be painful for some. There are plenty of choices, and they all cost appropriately. The general rule of thumb is that there is a reason if a massage costs less. And that reason is not just competing on the market! But even if you choose to visit some more expensive spa in Luang Prabang, you will still pay much less than what it would cost you back at home. So don’t get rapacious at cheap massage parlors! Afford yourself some experience you will remember. If you want to skip the glamorous resorts and do something more meaningful, you can always opt for a massage at the Red Cross complex. They offer affordable massages, but also have the herbal steam sauna! It’s comforting to know you are not only getting a spa treatment. You are also helping fight poverty in Laos while pampering yourself! The seller might not speak English, but her calculator does! If you are in a dilemma about what to buy in Luang Prabang, visit the Night market, and your difficulty will only multiply! Supposedly, it is one of the biggest tourist markets in Southeast Asia! Every evening, between 5 and 11 pm, Sisavangvong Road gets closed for traffic. Red and blue tents start popping up and take the street over. Several hundred stalls offering the most authentic Luang Prabang shopping opportunities become a packed labyrinth of temptations. Once you enter it, it is hard to leave this slow promenade of tourists observing and haggling among the red and blue tents. When searching for Google’s nightlife options on Luang Prabang map, one will see that the offer is quite limited. And the properties that are listed as night clubs close their doors at midnight! Luang Prabang bars must close by 11:30 pm! If you are looking for that last drink of the evening in Luang Prabang city center, you can check Icon Klub or Utopia. Most of the partygoers need to leave the city center if they want to extend their night. The most popular place is Luang Prabang Bowling Alley, as it stays open until 02:30 am! Sakura Bar and Muang Swa Night Club officially close at midnight. Luang Prabang curfew is essentially an adaptation to the town’s cultural heritage. If monks and almsgivers (see “the best things to do in Luang Prabang”, tip number 1) can wake up early, you should be able to do it too! While there are undoubtedly numerous intriguing places to visit in Luang Prabang, the relaxed vibe of the town invites you to explore it slowly. 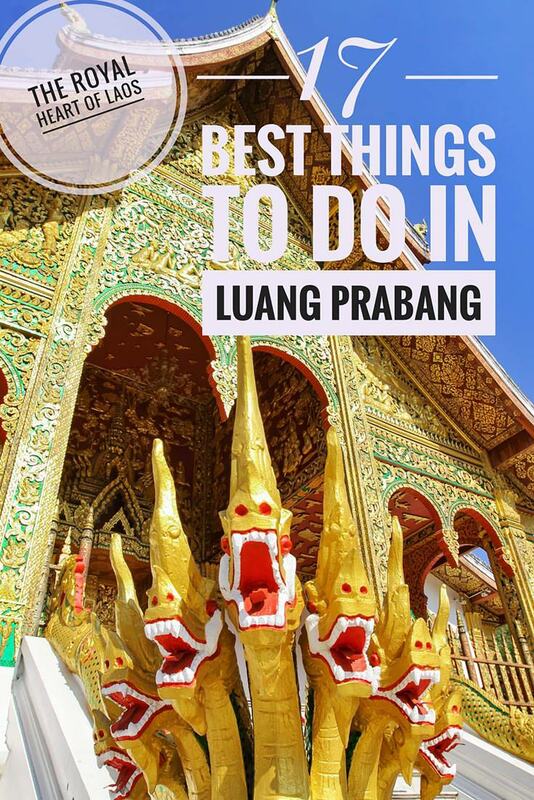 These may be 17 best things to do in Luang Prabang according to my hands-on experience, but you are very welcome to get lost and create your own perfect Luang Prabang itinerary! 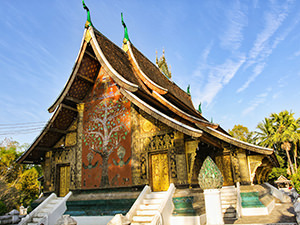 The unique blend of architecture, history, religion, gastronomy, customs, and natural surroundings build a solid basis for the development of Luang Prabang tourism in the future too. This is the jewel of Indochina, and the hunting season is open! Where is Luang Prabang on the map of Laos? Luang Prabang is situated in north central Laos. The city center is located on the peninsula at the meeting point of Mekong and Nam Khan River. Luang Prabang International Airport is connected domestically with Pakse and Vientiane, the capital. International flights from Luang Prabang are usually connecting via Bangkok, but airlines also offer connections with Chiang Mai, Siem Reap, and Hanoi. As the latest addition, since 2016, it is also possible to fly from Singapore to Luang Prabang. Taxis will take you from Luang Prabang airport to the city center; the prices are set. Check if your hotel can organize a free pick-up – mine (The Apsara) did! Buses and minivans will take you to and from other Laos destinations and neighboring countries. The roads are in poor condition, and traveling is slow. A trip from Chiang Mai to Luang Prabang will take 20 hours, Hanoi-Luang Prabang ride will last 24 hours, while the route Luang Prabang to Vientiane can take between 8 and 12 hours. One can go to Luang Prabang from Vientiane (and vice versa) with a stopover in Vang Vieng. I traveled the 340-kilometer road that way, and it was much more bearable! The popular way of getting to Luang Prabang from Thailand is by boat. From Huay Xai on the Thai border, the slow boat trip to Luang Prabang takes two days, with a stopover in Pakbeng. Technically, it is possible to cut down the journey to 6 hours, if you take the speedboat, but many consider it dangerous. In 2021, the Chinese are expected to complete the high-speed rail connection between China and Bangkok, which will also serve Laos stations. When to visit Luang Prabang? The answer to when to go to Luang Prabang indeed depends on personal preferences. Luang Prabang weather is subject to two distinctive seasons, so choose your experience according to that! Bamboo bridges in Luang Prabang are great messengers of the seasons! If they are up, the wet season has not arrived yet. The dry season lasts from November till April, with November-January period being the most popular among the tourists (expect higher prices!). The average temperature in Luang Prabang in January, the coldest month, is 20,5 degrees Celsius. In May, one of the warmest months of the year, it will rise to 28,7 degrees. The record high Luang Prabang temperature was 45 degrees Celsius! If you decide to visit Laos in the rainy season (May-October), expect afternoon showers! In Luang Prabang climate, August is the wettest month! If you are looking for greener vegetation, the abundant waterfalls, and cheaper accommodation, the best time to go to Luang Prabang is indeed the wet season! For the long term forecast for Luang Prabang, you can check yr.no. How many days to spend in Luang Prabang? If you are traveling through Southeast Asia, Luang Prabang is definitely worth visiting. It is a small, relaxed town, with no crazy traffic, unlike other Asian big names. For many tourists, it is one of the prettiest places in their SE Asia itinerary, so you should drop by! How long should one stay in Luang Prabang? That is truly an individual choice. If you are mainly passing through and want to see Kuang Si Waterfall and some significant places of interest in Luang Prabang you could easily do it in two full days. I stayed eight days in Luang Prabang and would have easily stayed even longer. During one’s Luang Prabang holiday, there are many things to explore, as well as food to taste, if you are into gastronomy! Disclosure: My stay at the Smile Luang Prabang Hostel, The Apsara and The Apsara Rive Droite, as well as dinners at The Paste and Tamarind were complimentary, but all opinions are my own. Also, this post contains affiliate links, which means if you click on them and make a purchase, Pipeaway might make a small commission, at no additional cost to you. Thank you for supporting our work! Pipeaway in The Mirror : Why the ‘Worst’ Seats are Actually the Best? Take me to your mailbox! Visiting websites regularly might not be everyone's cup of tea. Never miss the most substantial info from Pipeaway by subscribing to our monthly newsletter, packed with inspiring stories from around the world! And, yeah, enjoy your tea!